What seems like a lifetime ago, I left my homeland to pursue the dream of competing as a professional golfer on the world stage. My dream came true. The journey took me around the world, and throughout I enjoyed the commitment, the pursuit of my passion, and the successes I had along the way. Though I have been “global” for many years, my roots are in South Africa. I will always have a love for the competitive game, but the passion I have for my homeland became a powerful calling. 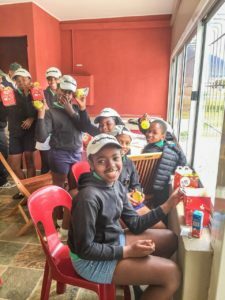 To see South African professional women golfers achieve their rightful place. To help South African business women understand the value that golf brings to them as a business tool…like the men have known forever! To inspire our youth through the Sally Little Golf Trust, dedicated to educating and empowering the previously disadvantaged, with an emphasis on young women, through the game of golf. With the endorsement of the Honourable National Sports Minister Tokozile Xasa, the Honourable Patricia de Lille, the City of Cape Town and the Parliamentary Sport and Recreational Council, we look forward to making a difference in many young lives. Please join me…together we can achieve great things! Capturing the Fire is a journey through the life of Champion Golfer, Sally Little, from the time that she was first induced to caddy for her father Percy, at the tender age of 10, right up to her being asked to captain the LPGA Legends Tour Handa Cup Team, that puts the best of the rest of the world against the best of the USA. As a teenager, Sally was a reluctant golfer but an accident, that almost ended her career before it started, changed her life. Golf became her life and after cleaning up against all opposition in South Africa, while still a teenager, she took the bold step to move to the USA and join the professional LPGA Tour. It didn’t take long for Sally to be crowned “Rookie of the Year” and she, with a number of equally talented and beautiful women, changed the face of women’s golf for ever. It wasn’t easy for Sally, alone in a strange land, thousands of kilometres removed from her family and mentor, Percy Little, Sally became cacooned in her own world of insecurity and inability to find the right coach and life partner. Illness almost brought Sally’s career to a premature end, forcing her out of competition for almost two years and just when she was about to throw in the towel, a letter from a fan gave her the motivation to continue and win the award: “Comeback Player of the Year”. Being Sally Little was never easy, she had to deal with Apartheid, sport isolation, being banned, bad management, ill health, failed relationships, the inability to have children; all that, while trying to make women’s golf as appealing as the men’s game, when dealing with intransigent administrators. Despite all of this Sally became South Africa’s most successful female golfer, often compared to her close friend and childhood hero Gary Player. If you are inspired by success against all odds, then Capturing the Fire will leave you inspired by Sally Little. To learn more about the different initiatives and programmes we have, click on the images below.